Both of my parents were born and raised in Mexico City, but my father’s parents were actually Polish Jews that immigrated to Mexico City from a small town outside of Warsaw. Growing up, my grandmother never really talked about Poland and seemed to embrace Mexican culture more–I have never heard her speak Polish to this day. I was always curious about where we came from and the only image I had in my mind was from my history books in school. When I graduated from college, I started to do a lot of solo-travel. I was spending some time with one of my best friends at her home in Hamburg and decided to take a train ride to Warsaw for a few days to see where my father’s family was from. Coming into Warsaw on the train was a bit surreal–you can only imagine the images of trains and Poland that were running through my mind. The first thing that struck me about the city was how gray it was. There was a distinct absence of color and vibrance that I’d grown accustomed to in other European cities–it all felt very cold to me. The food, however, was another story. I found Polish food–which is heavy on the meat, cheese, and potatoes–to be incredibly comforting and satisfying. Finding Polish food in Atlanta has been a bit tough and I have relied on making things–like pork cutlets and pierogi–at home. Until the other day, when a friend of mine called the other day with the best birthday present of all: a restaurant tip. Even though it was blazing hot outside, we decided to go have some Polish food for lunch. When I walked into the restaurant, I was surprised how spruced up the decor was–I wasn’t expecting something so swank. I was also amazed to see how full they were for lunch time in a month-old strip mall joint. The word must have quickly gotten out to the local Polish community. The space still seemed like it was unfinished. The bar area in particular. They don’t have a liquor license yet, but will be offering selection of Polish beers and other beverages soon. My friend and I ordered a bunch of dishes to try to get a feel for the place. He can always hang with me ordering a load of food. 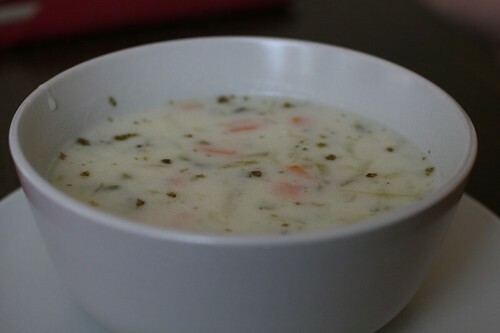 Pickle soup: I had never had this before, but it was awesome. It was not as heavy as it looked. The acid from the pickles added a nice tanginess against the creaminess of the sour cream. There were also nice chunks of carrots and potatoes. It was so soothing and I just loved it. Meat pieorgis topped with sausage and onions: The meat was a bit under-seasoned, but the sausage gave it the salt it needed. I would like to have them again, because they had potential. Nice dough and a good crust from a pan-fry in butter. I think the cheese may be the way to go. Croquettes with ground meat filling: This was the only dish I wasn’t interested in a third bite of. It was all a bit mushy to me, but my friend liked the flavor despite the texture. 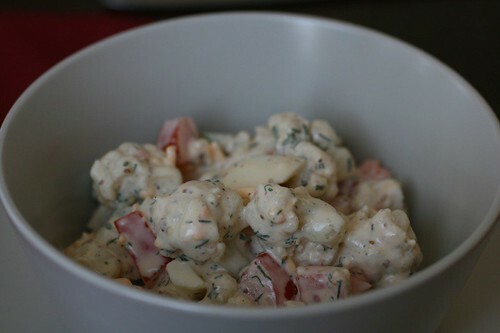 Cauliflower salad: This was my friend side dish to his croquettes. It was pretty tasty with crunchy bites of bell pepper and a nice pop of fresh dill. the only weird thing was the yellow cheese shreds, but it did not take away from the dish at all. 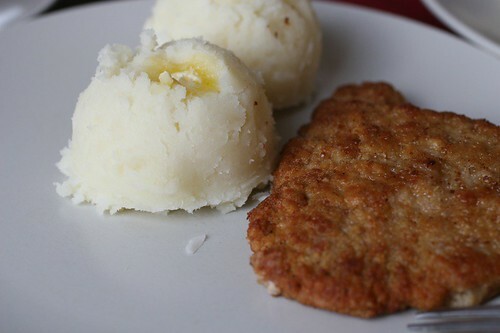 Pork cutlet with mashed potatoes: I am a sucker for a fried piece of pork. My Dad used to make these for me growing up. This version was a bit thicker so it was tough in places, but still quite good. Like everything else, it needed salt, but a quick sprinkle from the shaker on the table. The potatoes were a bit dry, but my friend liked the lack of fat. I could have used a bit more. I would still order this again–maybe with a different side. 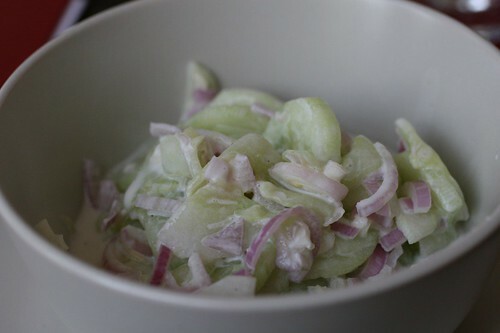 Mizeria (sliced cucumbers, red onion, and sour cream): The ingredients were fresh, but the lack salt prevented the dish from coming together in my mind. Maybe salt is not a traditional ingredient in the preparation, but it needed it. It was still a nice contrast against the heaviness of the pork chop. Verdict: All in all, I found the food to be straightforward and comforting–not to mention very filling! My friend described it as “honest” and I would have to say that is the best description. The soup was our favorite and I would go there for that and some pierogi again. All of the ingredients they used were very fresh and they just seemed like nice people. The waitress said that the menu changes daily, but there are standards that will stay on. Is this the best Polish food you will ever have? No. But, it is a nice place that deserves your business the next time you want some Polish fare. Address: 3425 Medlock Bridge Rd. Hey Bliss – nice find! My Polish mother will be thrilled to have somewhere to eat when she visits next. She just didn’t believe me for all of the years that I have lived here regarding the lack of Polish food and shops. Now, you don’t happen to know where to get authentic dried polish mushrooms do you? Patak says that they used to carry them, but stopped bc they didn’t get enough turnover (“only the Polish people bought them”!). I can’t even find them easily online. 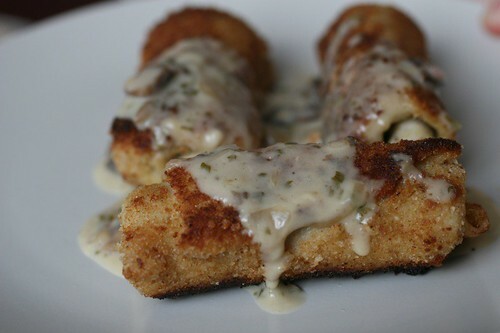 They are something like a porcini, but with a stronger yet more nuanced flavor. LizR: I wish I did know of a spot for the mushrooms. Maybe one of the Russian specialty shops in Atlanta? I will let you know if I find an answer. I just got back from here where I took my father for dinner. I read about it on AC and your website, and since I have 2 Polish grandparents, we had to go. I was fortunate enough to have the pickle soup – I ended up getting some to go .. it was so delicious and I will look online to see if I can find a recipe. I had the potato pierogi with kielbasa, and my father had the cabbage rolls. I took a pierogi home to my fiance, and the car smelled so good. 🙂 Thanks for the review – we wouldn’t have known about it without you! I just went to Gimza on Saturday night. The food was wonderful, and the owner was awesome as always… but the place was empty. This is the second time I’ve gone in a couple weeks, and it seems that business is slow there, although I don’t know why, because it’s quickly becoming one of my favorites! We just had the pleasure of eating at Gimza last night. What a fantastic experience. My husband, 2 kids and I took my parents. My side of the family is all Polish and we had an abundance of excellent Polish food growing up in Chicago. I can’t believe we found such a wonderful place in Norcross. Everything we ate was fantastic- and we are very picky. Great atmosphere. Very nice staff. My mom has already stated that is where we are going for her birthday in 2 weeks. We are also going to cater a Christmas meal. Best restaurant we have eaten at in months. I just had the pleasure of eating here this evening. This is some of the best Pierogi I’ve had next to my gram’s. I can’t wait to take my family here when they come to town. Marek was a great host and the atmosphere of the restaurant was delightful. I intend to become a regular. Great Polish food finally. Cured my homesickness for stuff I can’t get down south outside of Dickson City PA. The Polish beer was excellent too! My family and I finally got around to trying Gimza for lunch on Saturday. I don’t think my parents knew what to expect, but when I told them I read about it on your blog, they knew it must be good. I forgot to order the pickle soup, which I had intended to do. We did get the cucumber salad, and it was very good. But you were right, it did need a little salt. I got the potato and cheese pierogi, delicious. But my husband had the winner with the mushroom and sauerkraut pierogi. They were so incredibly good. 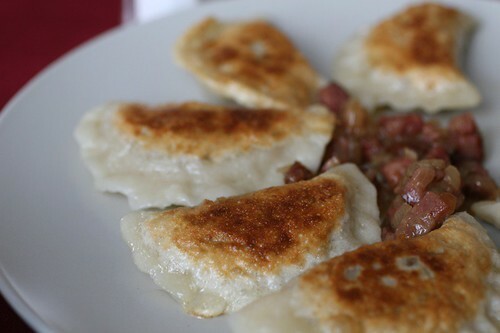 And we all loved the onion and kielbasa topping, it really complemented the pierogi well. We can’t wait to go back and try the soup and the Polish beer! Thanks for another great review! I have been to Gimza's and the food is very good. Reading the reviews I found that no one mentioned the best entree, the crepes. They are soooo good. I have recommended Gimza to friends and none of them have been disappointed and one of them is 1/2 Polish from Cleveland. I am from Chicago and am 1/2 Polish and enjoyed my grandmothers cooking. The only knock is that the Polish Sausage is smoked not fresh.